New monitoring parameters - Detect hard-to-diagnose conditions and improve patient care with Masimo Rainbow Technology(r). The Lifepak 15 is the first monitor integrating noninvasive monitoring for carbon monoxide, SpO2 and methemoglobin (to detect chemical exposures and certain drugs). Advanced support for treating STEMI patients - Easily acquire a pre-medication 12-lead ECG and then rely on the 15 to continuously monitor all 12 leads in the background and alert you to changes via our ST-Segment Trending feature. Using your 15 in conjunction with the Web-based Lifenet STEMI Management Solution lets you automatically and simultaneously share critical patient data with multiple patient care teams throughout a region. Most potent escalating energy available - ADAPTIV biphasic technology provides the option to escalate to 360J for best results. Recent studies have shown that refibrillation is common among VF cardiac arrest patients and that defibrilation of recurring episodes of VF is increasingly difficult. Another recent randomized controlled clinical trial shows the rate of VF termination was higher with an escalating higher energy regimen of 200J and over. The 15 gives you the option to escalate your energy dosing up to 360J for difficult-to-defibrillate patients. Proven CPR guidance - Demonstrated to aid users in performing compressions and ventilations wthin the recommended range of the AHA Guidelines, the CPR Metronome uses audible prompts to guide you without distracting vocal critique. And get hte post-event feedback you need to imporve CPR performance with CODE-STAT Data Review Software with Advanced CPR Analytics. Dual-mode LCD screen with SunVue - With one touch, switch from full-color to high-contrast SunVue mode for the best sunlight viewability in the industry. A large screen (8.4 inches diagonally) and full-color display provide maximum viewability from all angles. Upgradable platform - The Lifepak 15 is flexible to adapt to evolving protocols and new guidelines and upgradeable when you are ready to delivery new therapies. Latest Lithium-ion battery technology - Battery power that beats or matches every competitor in the market. Enough juice to run a shift, with less weight. The smart technology included in this battery system helps you manage your battery inventory appropriately letting you know when battery life is coming to an end. Data connectivity - As you treat patients, collect monitoring data in your Lifepak monitor/definrillator. Then easily connect to ePCR and other systems so information flows to where it is needed. Bluetooth has been simplified so you just touch a button to transmit data. Attention to detail - Finishing touches on this next-generation monitor/defibrillator include an ergonomic handle, larger SPEED DIAL for easy selction , and updated, easy-to-clean keypad. Works when dropped, kicked, soaked, dirty - The Lifepak 15 monitor/defibrillator passes 30-inch drop tests - equal to falling off a cot or dropping it in transit. IP44 rating means it keeps working in steady wind, rain and other harsh environments. Toughened inside and out - A shock-absorbing handle and a double-layer screen that can take a beating from doorknobs and cot handles have been added. The cable connections have been redesigned for confident monitoring and therapy delivery. 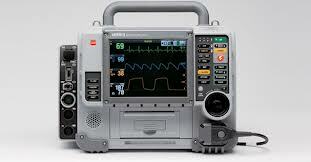 The Lifepak 15 is the new standard in emergency care. Click the button below to add the PhysioControl Lifepak 15 Patient Monitor Defibrillator to your wish list.